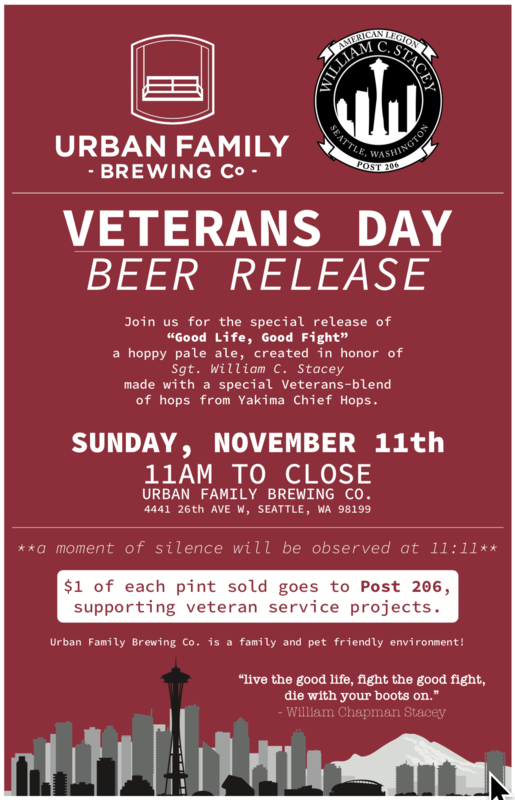 William C. Stacey American Legion Post 206 of Seattle (Post 206) has teamed up with Urban Family Brewing (UFB) to observe Veterans Day 2018 by brewing a beer benefitting their post and honoring Sgt. William C. Stacey. Will was a Sergeant in the USMC who was killed in action in Afghanistan, on January 31st, 2012. His mantra leading up to his death was “Live the good life, fight the good fight, die with your boots on.” And so, "Good Life, Good Fight" was born. “Good Life, Good Fight” is a hoppy pale ale brewed with 44lbs of "Veterans Blend" Yakima Chief Hops (YCH) that will be released at UFB's taproom in Magnolia on November 11th at 11am. YCH donates $3 per pound of "Veterans Blend" hops sold each year to a veteran charity, and this year's charity is the Semper Fi Fund. Additionally, UFB has committed to donating $1 from every pint of "Good Life, Good Fight" sold in the taproom, 10% of every keg sold, and 100% of all limited-edition event t-shirts sold directly to Post 206. As Veterans Day began to edge closer to observance this year, the members of Post 206 endeavored to find a new way to connect with the local community. In the past, Post members stood outside store fronts, handing out Poppies, a symbol of Armistice Day in Europe, Remembrance Day in Canada, and Veterans Day in America. These poppies signify support for the veterans of our armed forces, however Post 206 Commander and co-founder Jordan Houghton, saw handing out poppies outside stores as an antiquated approach to engage with their Seattle community and lacked the meaningful engagement he and the Post members longed to achieve. The mission of Post 206 is simple: Provide meaningful connections for veterans, serve the community, and honor the memory of Sgt. William C. Stacey. Enter, co-founder and Senior Vice Commander, Joey Hernandez. He proposed to the members that Post 206 approach Veterans Day engagement in a radically new way. He reached out to his favorite brewery and asked if they would be interested in a collaboration. The owner of Urban Family Brewing Company, Andy Gundel and his team, wasted no time pledging their support in collaborating with Post 206. After all, Joey Hernandez was not just a co-founder of Post 206 but a valued member of the UFB family as well.